H&W: Firstly, congratulations on making one of the best albums I’ve heard this year. 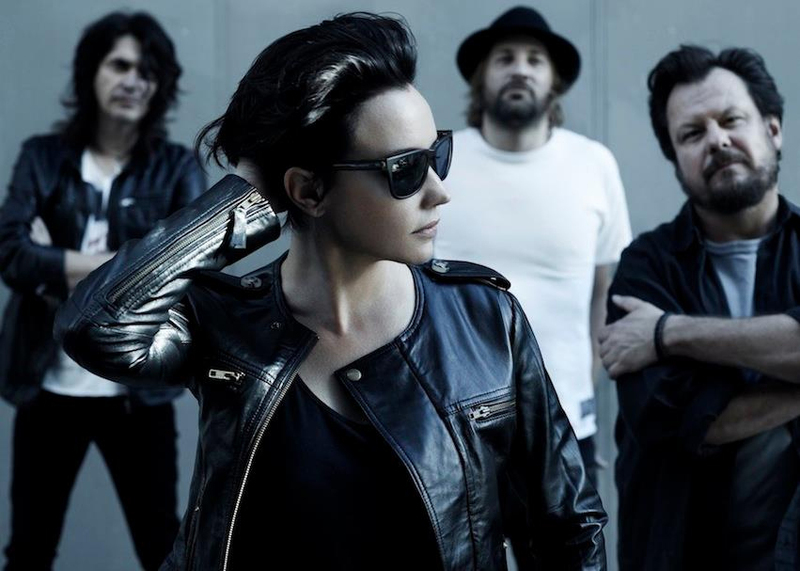 Suze DeMarchi: Thank you! That’s very kind of you to say. 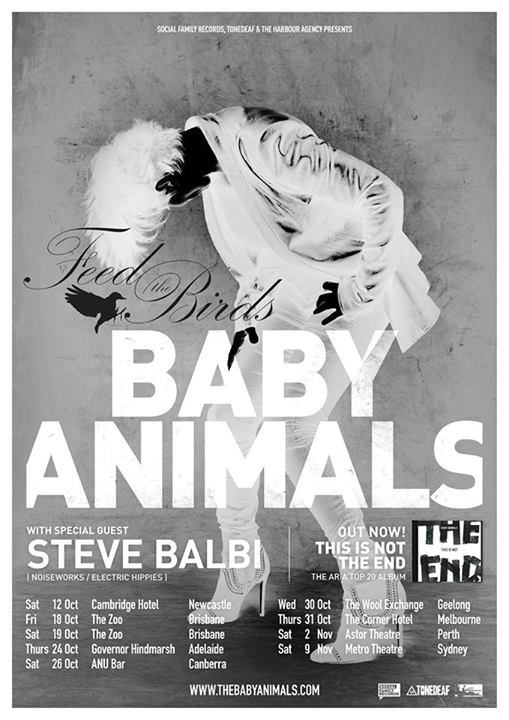 I really enjoyed it, it’s easily the most consistently great record Baby Animals have released. Did you know you had a special batch of songs going in? We just kept writing until we felt like we had a cohesive record. There were a few other songs that I thought, when we went into pre-production, I thought for sure would make it on the album, but they didn’t really… We wanted just to make a record that flowed really well. 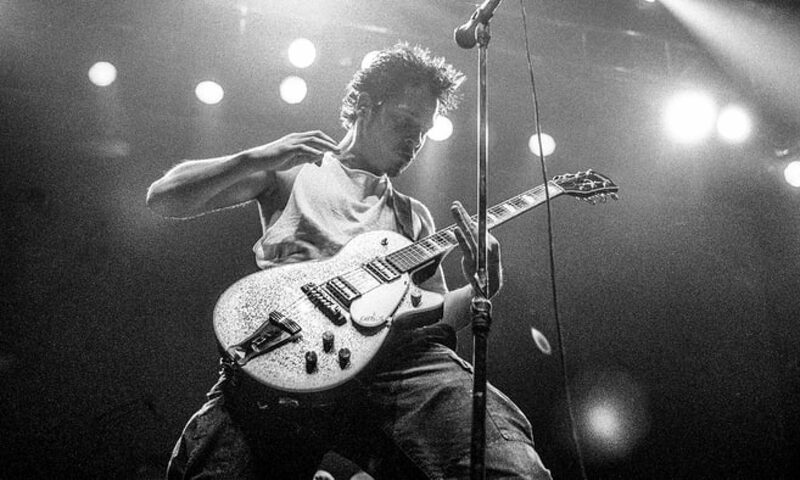 You’re not really thinking about that when you’re going through the motions, you’re just thinking about making each song as good as you can make it, and that’s kind of what we did, so it’s nice to hear that people think that because, you know, the response generally has been pretty good. I’m just always surprised when people like something that you’ve done, because you know, I like it, but you don’t expect everyone else to like it, so it’s good. The songwriting partnership of you and Dave Leslie is really at the core of This Is Not The End. How did the two of you hook up with Dario (Bortolin) and Mick (Skelton)? You know, that was a one time thing that happened a couple of years ago…and it, I don’t know, it was just one of those moments on stage, it just kind of seemed like the right thing to do to this person that was in the front. *laughs* I don’t know what happened. And then it just turned into a kind of a thing that kept happening. If something went wrong on stage I’d always sort of step in and say “oh, it’s time to feed the birds” if someone has to change a string, or you know, whatever, if something was going wrong. And people let me do it! I don’t know why they let me do it but they do! And I’m always surprised that they do, and I just think it’s a really fun, silly, kind of, you know, a little thing to do with people. It’s always amazed me that they let me do it. Someone spat it back in my face once, that was interesting. Yeah, horrible, I know! But so anyway, that’s how it started and it’s turned into a bit of a thing now. Given the success of your recent album tour, was the decision to record a live DVD and share that energy with a wider audience the next logical step? Yeah! And also, we’d never done one, you know? We’d done videos and stuff, but we’d never… And playing live is our thing, it’s really what we love to do the most, and we’ve never done a proper live DVD, and we just thought we have to do one on this tour, and we wanted to do it at The Metro in Sydney because it’s such a great room. Good room to film in, we’ve always had good fun playing there. So we kind of asked people, because we’ve been engaging with people online a lot since we came back, and we got such a great response from it, and people are funding it. They are the reason why we can do all this stuff. They’re funding it, they get their name on the credits. So they pre-order it, and because we’re independent now, that allows us to do stuff like this. It’s just so cool, and we’ll hopefully do a lot more of that kind of stuff. Well you’ve kind of lead into my next question actually. How have you found working with an independent label as opposed to dealing with bigger record companies in the 90’s? I think the main difference is that is really is more your business, rather than leaving your career in the hands of somebody else that can change in an instant. You don’t know who you’re going to get in a company if you’re doing something with a bigger label. Your A&R guys change all the time, people don’t necessarily have the same vision. You know what? It’s hard, but it’s a lot more rewarding in some ways because you get out of it what you put into it. And you just have that direct sort of connection with people. You just control it more. So I think as a business, if you’re looking at it as an industry, the music industry’s going through a strange time. There’s a lot of change. You have to work out other ways to make it work for you ’cause you don’t want to stop doing it. This is something that you’re born to do. I’m not happy unless…you know I stopped for a long time when I had kids, and I really missed it. I do honestly feel that this was my calling, I was meant to do this sort of thing. I love it, I’m really lucky to have a job that I’m into. I like going to rehearsal and I like going on tour. I think the younger generation, now, they don’t really know any other way unless they go on the Voice or something like that to be seen. That’s really the only way I know of doing it, you do it all yourself. Those labels just aren’t picking up little bands like they used to. No I know, I think they’re all terrified of losing the revenues that they have, but record companies have for far too long been taking too much percentage from the bands, and they couldn’t survive. Plus giving them massive advances to make the records. And musicians don’t know, they think that ‘oh great, we’re getting all this money to go and make these records’ and then you have to pay it back. So you never make any money off the album sales unless you’re selling millions of records. You end up working for the label. There should be a school or something, you know a pre-requisite, before you get into the music industry you’ve gotta know some of the business, you’ve gotta actually spend some time taking control of that stuff because you will just get walked all over. We’ve all been through that stuff, because you trust people to be good at their job and you do your job, but that’s not the way it is anymore. You have to keep an eye on that stuff. It seems that being in a band isn’t about making music anymore, it’s about managing a business. There’s no place for music in the record industry, I’ve always thought that. It’s come full circle though, I think the internet’s opened up doors for people. People need to stop complaining about Spotify and streaming services, when actually your album is your marketing tool. That’s what brings people to you. It should be about performing. And you’ve just got to think of other ways to make money from it so you can keep doing it. I don’t think you should be in music if you want to be really rich, that’s for sure. I think what happened was.. I don’t think it was on the American version. When Liberation bought the rights it took them a long time to get it from the defunct label, Imago, and just trying to track down Terry Ellis who ran it, because he still owned those masters, so that was a bit of a nightmare for them. And god bless Dean McLauchlan from Liberation, he didn’t give up for…it must have been three years he was trying to get the rights to do a licensing deal to re-release. So it’s thanks to him that those records came back out. And that’s why, I think it’s because that wasn’t on the American version. I noticed when I saw you in Brisbane, you’re playing what looks like a 52 Telecaster Reissue. Yeah, that’s the only guitar I play, really. I’m really jealous, ’cause I’ve wanted one for ages! It’s a beautiful guitar. 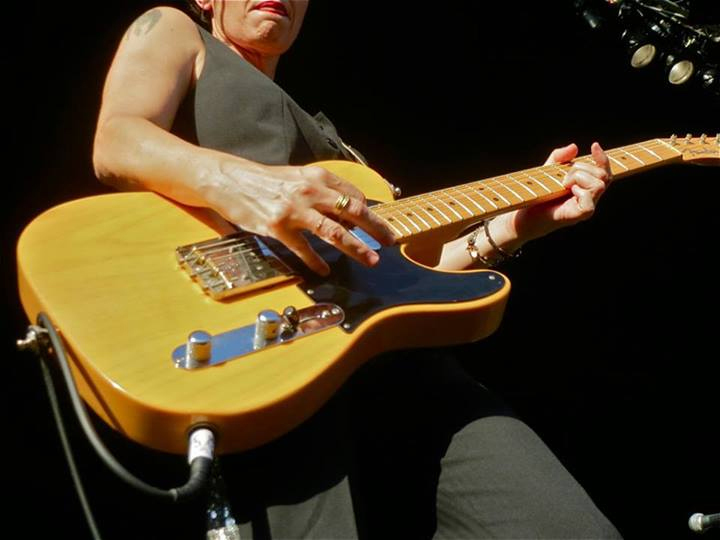 That guitar was given to me by the Fender people in L.A. It was one of the guitars used by Joaquin Phoenix in Walk The Line. So that’s a cool little bit of trivia. It’s a great guitar because it’s light, really nice and light to wear onstage. That’s surprising, because a lot of Tele’s are really heavy. I have an old G&L that I got 20 years ago that I never play because it’s so heavy. I don’t have many guitars, I’m not a gear head like Dave is, I’m just ‘Oh just give me that one, that’ll do’. Two pedals. I usually just play through Fender amps. I like the Fender/Tele combo, and that’s it. What sort of effects are you running? You said you were using two pedals? Really, I just use a distortion pedal, like a Tubescreamer or something, and a chorus, that occasionally I’ll use, or an echo pedal, depending on what Dave throws my way. *laughs* But I always just have a booster. All I need is clean and dirty. If we started doing some of the older songs from the first album, or the second album that need more chorus or something, then I throw another pedal in. For me, the simpler the better. Even having a tuner on stage bugs me. Is there a particular song you’re enjoying playing live at the moment? I’m loving playing a lot of the new stuff, it’s always exciting when you haven’t played stuff a lot over and over again. You’re still kind of getting used to it and you hear different things in it the more you play it, and you get different crowd responses each time depending on how the band’s playing it. I love playing ‘Under Your Skin’ live. It’s very different than the album version, it’s just so much heavier. What we like to do at the end of the set is, the new album’s got a really nice build to it so we throw in songs like ‘Hot Air Balloon’, ‘Got It Bad’ and ‘Email’ and then ‘Under Your Skin’ or something like that. It just keeps building, it feels like it’s going to blow up at the end. We really need to get pyro at the end to make it explode! *laughs* I love playing ‘Warm Bodies’ as well live, it just brings it all down, it’s just a nice sort of simple, sweet, gooey, woozy sort of song. It’s a great song, that one. Thank you. Yeah, I like that one. 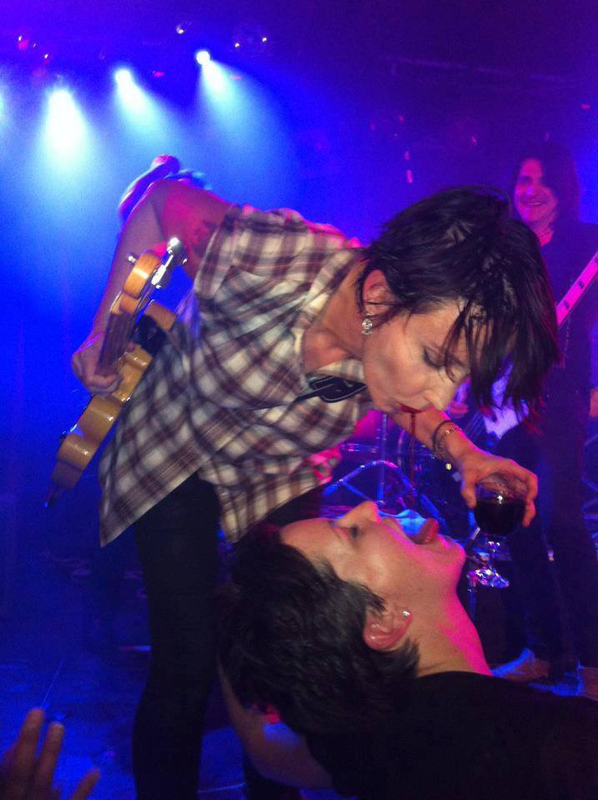 This last couple of questions are from my next door neighbour Jackie, who has been a massive Baby Animals fan since the early 90’s: Have you found it difficult to juggle touring and parenting? Do you have any advice for raising teenagers? Oh my god! Yeah it’s very hard juggling it. My daughter’s 17. If she could give some advice that would be great because I don’t know what the F I’m doing! It’s like a minefield out there being the parent of a teenager. The biggest thing I guess is remembering that they’re not you, they’re different people, so they have their own ideas about stuff. They think they know everything, teenagers, but you know I still feel like a teenager half the time anyway. I just have to remind myself that she’s somebody else, she’s not actually me, so she’s not going to have the same road that I had. I left home at 17, I was in a band at 17, and she’s still in high school, she’s got big plans to be an actor and she wants to study and go to college in New York. I just couldn’t wait to get out of home when I was her age. She’s got it so easy here, you know, and I’m a pretty cool mum, I’m not that strict. I am in some ways, but you know, we listen to music together and we talk about a lot of stuff that I guess some parents wouldn’t bring up with their kids. So she wouldn’t leave, why would she want to leave? She doesn’t have to do anything! My parents were very different than me. But juggling parenting and having a full-time job, and I’m a single mum too, so I’m still trying to figure that one out. I think you’ve got to be easy on yourself and not try and do everything, and then get down on yourself when you do have to go away and spend time away, because kids will be fine. It’s worse for my boy, who’s 11. He needs me more than my daughter does I think, at some level. Anyway, that’s my mumming advice. The last question I’ve got for you is: Are there any up and coming bands that you’re into at the moment that you’d recommend? Oh dear, don’t get me started! Tell her rap was cool in the 90’s. Yeah, exactly! We invented that, it was our generation! There’s some great new stuff, Imagine Dragons, and Haim, my daughter put me on to them. They’re sort of weirdly daggy, but cool. Kind of like a cross between Wilson Phillips and The Eagles or something like that. Very odd, but cool. I think I might start a blog with her and do song of the week and we can dissect a song every week. I can give her one of mine and she has to dissect it and she can give me one of hers and we can pull it apart. Tell you why we like it or why we don’t, why it’s good or why it’s not. That sounds like a good idea, I’d read that. Yeah, good, I might do it!